ROADMASTER brings you fifteen rich new trim choices-- five different hues of genuine leather in the Convertible and ten Riviera and Sedan interior trims -- including new gold- or silver-woven-on-fabric patterns. Seats are double-depth foam rubber, even the carpeting is cushioned on thick foam rubber. The ROADMASTER Sedan has a built-in sun visor plus rain coves over all four doors for dry driving in wet weather. 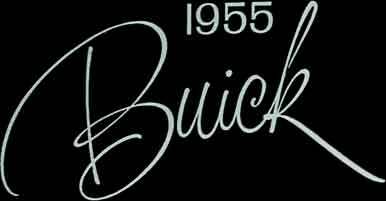 Buick's magnificent curved panoramic windshield adds a crowning note of modernity and gives you wide, unobstructed visibility of the road ahead. The ROADMASTER instrument panel, with its easily accessible controls and exclusive Redliner speedometer, is finished in new jewel-like beauty. High-fashion note in '55 is the new Riviera styling to this Sedan's rear window posts. Custom beauty of all 1955 ROADMASTERS is highlighted by golden hood and trunk emblems.